Right now, there is probably something you want to tell one of your colleagues… but you’re holding back. It’s something that’s hurting their career, and they seem to be totally oblivious to it. You’ve wanted to tell them about it for a while, but you haven’t because you are afraid that they will be offended and that the subsequent fallout will make things awkward between you. Sound familiar? The situation described above happens so frequently in the workplace that we tend to overlook the colossal drag it has on people’s careers and on overall team productivity. Kim Scott, former Google and Apple executive, described a time when a new employee she hired for her own tech start-up was consistently producing sub-par work. Instead of addressing the problem, she let it go… until it got so bad that she had no choice but to fire him. When she explained to him why she was firing him, the employee looked her straight in the eye and asked, “Why didn’t you tell me?” In her book Radical Candor, Kim Scott describes the deafening silence that followed his piercing question as the low point in her career. As former HR leader, I’ve seen this scenario play out countless times, and managers rarely realize that they are the ones at fault. To say this practice of withholding feedback is “unfair” to employees is a reprehensible understatement. Not providing employees with candid, timely performance feedback is the equivalent of assisted career suicide. Lack of giving and receiving feedback isn’t just holding individuals back, it is holding organization’s back. Imagine what your organization would be like if everyone asked for and accepted feedback? Think of the mistakes that would be avoided, and how the quality of work would improve if colleagues were comfortable sharing their insights about each other’s work. Consider how customers would react if they believed that everyone in your organization was sincerely trying to improve, and that employees truly valued customer feedback. The ability to solicit, accept, and act on feedback is the ultimate performance-enhancing skill. It’s the most important step in learning and development. You can’t improve what you don’t know needs to be improved. So why do we sand by as idle witnesses, saying nothing, as others are unwittingly killing, or at the very least stalling, their own careers? And why do we get our backs up when someone points out something that we are doing wrong, or that’s making us look bad? It’s because most of us have been conditioned to believe that receiving critical feedback is shameful, and that it’s career limiting. As a result, we have learned to fear critical feedback like the plague. Get comfortable talking about their mistakes. Here are 10 practices to help you do this. 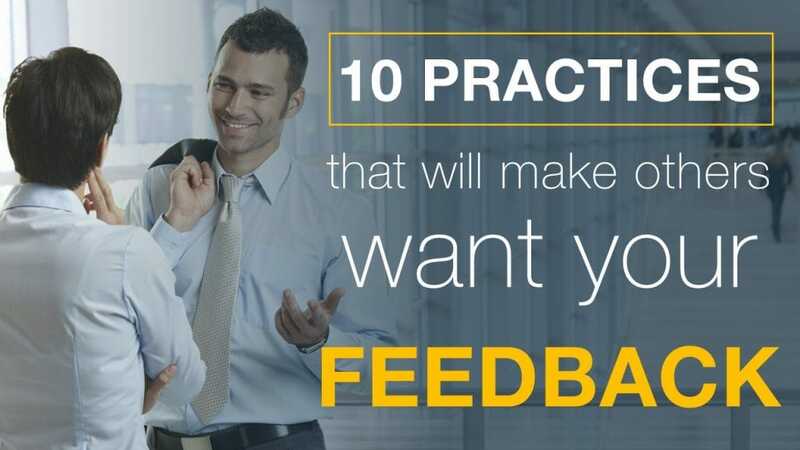 Before you give feedback, you need to demonstrate in spades that you want feedback. Feedback to others is sure to land badly when it comes from someone who never accepts any themselves. When asking people for feedback, don’t say “Do you have any feedback for me?” 9 times out of 10 people will say “No” and you’ll go your merry way, none the wiser. 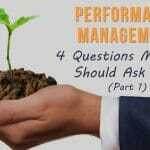 Instead, frame the question as, “What feedback do you have for me?” Then wait and don’t let them off the hook until they give you something meaningful. People are generally pretty uncomfortable saying bad things about us to our face. When I ask clients “What feedback do you have for me?” they often say “Nothing really, I don’t think I’d change anything.” That’s not helpful, so to make it easier on them, I often follow up with “How about you tell me two things you thought I did well, and one thing I could improve for next time.” When I ask this, they can tell I really want their feedback, plus I’ve given them an easy path to give me something I can work with. Oftentimes, in an attempt to spare our feelings, people will give us vague feedback. If the feedback you received isn’t very actionable, a great follow-up question is “How can I do better?” World-renowned executive coach Marshall Goldsmith contends that this question a) solicits advice rather than criticism, b) is focused on the future rather than the past, and c) gives the distinct impression that you intend to act on the feedback. When someone actually musters up the courage to give you feedback, it’s essential they leave with the impression that you sincerely value and appreciate their honesty. Any benefits of asking for feedback will be eradicated if the feedback isn’t received in a spirit of gratitude. It’s important to note here that tone makes all the difference in the world. “Can you give me an example?” is sometimes used as a defensive response. You can tell by a person’s tone whether they are asking for specifics because they truly want to understand better, or whether they intend on using the specifics to argue their case on why the example isn’t valid. There’s a saying that “People who shoot the messenger stop getting messages.” Managers who punish others for being honest with them doom themselves to remain ignorant of what’s really going on around them. To make absolutely sure you don’t shoot the messenger, find some way to reward people who give you the honest, ugly truth. The first way to do this is to follow up with them a few days later to let them know that you’ve reflected on their feedback and plan to work on it. Go out of your way to give them some extra attention, and perhaps extra responsibility. Make sure they know that you respect people who give you the ugly truth. If you disagree with the feedback, meaning, you think it’s inaccurate, don’t dismiss it; and for heaven sakes, don’t argue with it. The accuracy of the feedback is irrelevant. That’s right. I’ll say it again… The accuracy of the feedback is irrelevant. What’s relevant is whether you want the person to hold that opinion of you. In their book Change The Culture, Change The Game, authors Roger Connors and Tom Smith argue that even feedback that you know is inaccurate is valuable because it gives you insight into what the person giving it believes about you. Something must have occurred to make the individual giving it believe it is true. So ask yourself “Is this the belief I want them to hold?” Likely, the answer will always be “no.” The next question you need to consider is “What can I do to change their belief?” If you want to change their belief, you must give them tangible, consistent evidence (through your actions, not your words) that their belief about you is no longer true. You might think that you’re working on changing the perception of the person who provided it. But the person who provided it will see you trying to act on their feedback. That’s the most important thing. Getting comfortable talking about your mistakes is more important than simply talking about your mistakes. When managers make a mechanical attempt to “be vulnerable” they often reveal superficial, irrelevant mistakes and they come off sounding weird and contrived. Good leaders get comfortable talking about their mistakes in a natural, authentic way. A senior manager at one of my clients recently shared the following experience with me. It’s generally hard for people to talk about their mistakes, but sharing critical feedback about yourself takes it to another level – a necessary level if you want others to get comfortable receiving critical feedback from you. Imagine what people would think when they hear their boss say that he recently received feedback that he routinely cuts people off in conversations, and that he plans to work on changing this. Likely, the respect his colleagues and employees have for him will shoot up. Everybody knows he cuts people off, but that’s all but forgiven the moment he acknowledges it in public. In an instant, it changes feelings of resentment to feelings of empathy and a desire to look inwardly at our own faults. That one act alone can begin to change a culture of finger pointing into a culture of self-improvement. In the spirit of requesting feedback, I’d like to hear from you about any other practices you have seen that inspire others to be more receptive to feedback. Please share your thoughts in the comments section below. Thank you! Good article as always. My experience is that leaders feel that asking for feedback shows a sign of weakness not strength. Thanks John. That’s been my experience too, but it’s amazing how liberating it is (to the manager and to their team) when a manager finally makes takes the leap of faith to publicly admit their mistakes.